It’s Christmas Eve! If you’re like me, that means lots of relaxing, eating, and spending time with my family. And maybe some last minute (yes, now it’s really last minute) baking. If you’re seeking a relatively quick, very easy, festive holiday cookie, look no further. These are great for the chocoholic (sorry, not me) in your family. Or a chocolic friend, because who doesn’t like to be surprised with a plate of cookies this time of year? Preheat the oven to 350. Cream the butter, sugar and ⅓ cup cocoa powder. Mix well until one thorough mixture. Combine the flour, salt, baking soda and baking powder in a separate bowl. Add to the butter mixture by thirds and mix until combined. Roll the dough into small balls, about one-inch in diameter. Indent each ball with your thumb or a small spoon in the center. Bake for 7-8 minutes until cookie dough is lightly cracked on the surface but still soft. When they come out of the oven, don’t be surprised if your thumbprint is gone! You’ll likely need to press the center of each cookie down again to make your frosting well. Cool completely. While cookies are cooling, make the frosting: mix the cocoa powder, powdered sugar, hot water, and vanilla. Spoon the frosting into the centers of the cooled cookies and add festive sprinkles while frosting is still wet. Allow frosting to set before putting away. Enjoy! I’m not a huge chocolate fan and even I enjoyed one (or a few). They’re not MY favorite (again, not a big chocolate fan) but they were definitely a hit. For simple modifications, I may play with the filling, adding peppermint or peanut butter in the future. What are some thumbprint cookies you enjoy? I love jam cookies! I LOVE biscotti. I grew up with biscotti – my mom seemed to always have a package of Nonni’s biscotti on hand for desserts, snacks (breakfast…shh), etc. There’s just something deliciously satisfying about the crunch of a good biscotti, paired with some coffee or hot tea. Amiright? And now that I know how to bake them (I’ve made a few different kinds before, including chocolate pistachio biscotti and pumpkin biscotti), I am loving them even more! Seeking a last minute cookie to bake for the holidays? Okay, I guess it’s not quite last minute yet, but these make the perfect Christmas cookie. The green pistachio and red cranberries are festive – but these really are great all year round. I made these for a holiday party/cookie exchange and recommend you try them out too. The recipe is from B’s mom, and I was so grateful that she shared it with me – so now I’m sharing it with you! Add eggs and vanilla. Work into dough using hands. Drain cranberries and add to dough with pistachios. Roll into two logs. Flatten slightly and place on greased pan. Brush with egg wash (1 egg plus 1 Tablespoon cold water). Bake for 50 minutes, slice into pieces and bake an additional 10 min. per side. Makes approximately 36 biscotti cookies. Enjoy! I also made this recipe sheet if you’d like to print out the recipe (click here to download the pdf). What’s a favorite family cookie recipe? Have you been baking Christmas cookies yet? If your schedule has been anything like mine, you’ve been busy baking up a storm for cookie exchanges, holiday parties and office gatherings. For this year’s work cookie exchange, I opted to make these cookies. I knew I wouldn’t have time to make them completely the night before, so I actually made the dough, froze it, and then baked and dipped them in chocolate and sprinkles the night before. These cookies are good – not too sweet, but delicious and festive (if you add rainbow sprinkles)! A great cookie exchange addition. Recipe from the kitchn. The original recipe says it makes 70-75 cookies. Don’t know what I did differently, but mine made about 45. If yours makes 70, PLEASE let me know what you did! Cream together butter, powdered sugar, and salt until smooth. Add vanilla. Using a hand or stand mixer on, low speed, mix in the flour until combined and a dough is formed. Fold in 1 cup of the chocolate chips and the Heath Bar chips. Divide the dough in half and shape each half into a log about 10-12 inches long. Wrap both logs of dough in parchment or plastic wrap. Refrigerate the rolls until firm (a few hours, or up to three days). The logs can also be frozen if you don’t plan on baking them within a few days, just make sure to thaw in the fridge overnight before baking. When you’re ready to bake the cookies, cut the logs into 1/4- to 1/2-inch thick slices. Preheat the oven to 350°F and line two baking sheets with parchment paper. Arrange slices slightly apart on the baking sheets. Bake the cookies for 13 to 15 minutes, until the edges just start to brown brown. Let the cookies cool on the baking sheets before removing from the pan. Melt the 1 cup of chocolate melting wafers in the microwave in 15-second intervals, stirring between each interval. Dip one end of each cookie into the chocolate and use a butter knife to scrape off the excess chocolate. Place the dipped cookies on parchment paper. Optional: while still wet, add festive/colorful sprinkles. Wait until set before storing or tasting. What twists on traditional cookies do you make to give them more of a holiday appeal? I like to shape them into fun holiday shapes (candy canes, snowmen) or add red/green sprinkles (like these!). What’s your go-to cookie for cookie exchanges? Have I mentioned I’m a Meatless Monday blogger? I am! And while I’m not a vegetarian, I do enjoy the occasional meatfree dish. That’s why when I was provided a package from Lotus Foods with a few different meatless, carbalicious (rice and ramen) yum yums, I was super excited to try them out and share the recipes with you. I had also recently gotten some coupons from Silk and was interested in seeing what I could make from the both – what could I do to combine Silk’s dairy free milk with Lotus Foods package? I’ll have some savory meals coming soon, but first off, I knew I had to try making some rice pudding. My mom always made such good rice pudding growing up. It was creamy, soothing, warm, and so so so delicious. Inspired by memories of her dessert, I bring you Almond Milk Volcano Rice Pudding. Probably a little better for you than the version I had growing up, but still pretty good! Place the almond milk in a medium saucepan over medium heat. Bring to a gentle bubble and lower the heat to simmer. Add the rice and season it with the cinnamon, nutmeg and cardamom. Stir until the spices are evenly coating the rice and almond milk. Cook for 10 minutes until milk is starting get absorbed. Pour into an oven-safe pan and cook for 20-30 minutes at 350 degrees until nearly all of the milk is absorbed. Serve warm or cold, topped with additional cinnamon and maple syrup if you like. Have you ever had volcanic rice? What did you think of it? What’s your favorite rice dish? I need new recipes! Do you have a favorite childhood dessert? Disclosure: While I was not compensated for this post, product was provided to me by Silk and Lotus Foods. My views and comments are solely my own and do not represent those of Lotus Foods or Silk. For more Meatless Monday posts, check out some of my past recipes or visit the linkup below! It’s officially pumpkin season here. While fall is not my favorite season, I do love the excuse to make anything pumpkin flavored. Including pumpkin granola. So when I got some Manitoba Harvest Hemp Hearts in the mail to try out, I knew exactly what I would do with them – make granola! And since I was craving some pumpkin granola, I combined the two – so here you go … pumpkin hemp hearts granola. It’s pretty good. It’s a little less sweet than the typical granola I make (feel free to add more sugar if you want it sweeter) and a little softer (pumpkin will do that to it) BUT it’s the perfect fall breakfast or snack. I dare you to try it with pumpkin yogurt! Optional: Dried fruit, such as cranberries, cherries, etc. Preheat oven to 325F degrees and line a large baking sheet with parchment paper. In a large bowl, combine the oats and hemp hearts. Set aside. In a medium bowl, mix together pumpkin puree, cinnamon, cloves, nutmeg, ginger, allspice and brown sugar. Mix until puree is a little darker and smooth. Add in maple syrup, honey and melted coconut oil. In a separate bowl, whisk egg white. Add to pumpkin puree mixture and mix until evenly combined. Pour over oats and hemp hearts and mix until everything is just wet. Spread onto the baking sheet pat oat mixture down tightly. Bake for about 40 minutes. Check about every 15 minutes and stir if it is starting to burn. Allow granola to cool for 30 minutes on the baking sheet before adding in dried fruit. Store in a covered container, such as a jar. Granola won’t be as crunchy as other granolas because of the pumpkin – but it’s delicious! What’s your favorite pumpkin flavored treat this time of year? Yogurt? Latte? Cookies? Any pumpkin haters out there? Do you prefer dry cereal or with milk? I love dry cereal. I sometimes like cereal or granola with yogurt- but never milk. 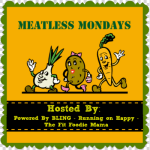 For more Meatless Monday posts, check out some of my past recipes or visit the linkups below! B loves scones. You may know that – I’ve made them before (blueberry buttermilk and pumpkin are my faves), but I’m always looking for new recipes to try out. A few months ago, B and I were in Cincinnati and we stayed with our friends Teddy and Suzanne. In the morning after we woke up, we were greeted with french press coffee AND freshly baked cherry almond scones. The scones were SO good, that B had to have the recipe. Teddy had baked them himself, so of course he had to share the recipe. And now – I’m sharing them with you! In a bowl, combine dry ingredients: flour, sugar, baking powder and salt. Cut butter into small chunks. Add pieces to dry mixture. Using a pastry cutter or your fingers, incorporate butter pieces until mixture resembles coarse crumbs. Add in the cherries and almonds. In a separate bowl, combine eggs, coconut milk and almond extract. Create a well in the center of the dry ingredients. Add wet ingredients to the well. Carefully combine, just until moistened. Place dough onto a work surface, and pat and shape dough into a 1/2 to 1-inch-thick round. Cut into 8 wedges. Transfer to baking sheet lined with parchment paper. Brush with a Tablespoon of sugar and lemon rind (optional) on top. Do you like sweet or savory scones? PS- I just realized I went ALL july without posting a recipe!? How the heck did that happen? I know, I just shared with you a ginger cookie recipe – and it also had triple in it. Triple the chips. This one is a little different – it’s triple the ginger! Yum. As you know, I’m a gingerholic so this recipe is definitely for me – and if you’re a gingerholic as well, you will love it! Preheat to 350°F. Line 2 baking sheets with parchment paper. Combine flour, finely chopped crystallized ginger and baking soda in a medium bowl and set aside. Using electric mixer (I love my Kitchenaid! ), beat butter until creamy. Gradually add in brown sugar, egg, molasses, fresh ginger, ground ginger, cinnamon, and cloves. Beat until fully combined. Slowly add in flour mixture, beating on low as you combine. Roll the dough into about Tablespoon sized balls and roll in granulated sugar to coat. Place coated dough balls on baking sheet and cook for about 15 minutes. I LOVE these cookies. B loved these cookies. My mom loved these cookies. I am definitely going to be making these again. They’re much more gingery than the last ginger cookie recipe I made and I think I may add in some chocolate next time too. YUM! Do you like ginger and/or spice cookies?